We are excited to announce that the 2nd Behavioural Economics in Business Forum will take place on 23 March from 10 am to 12noon. 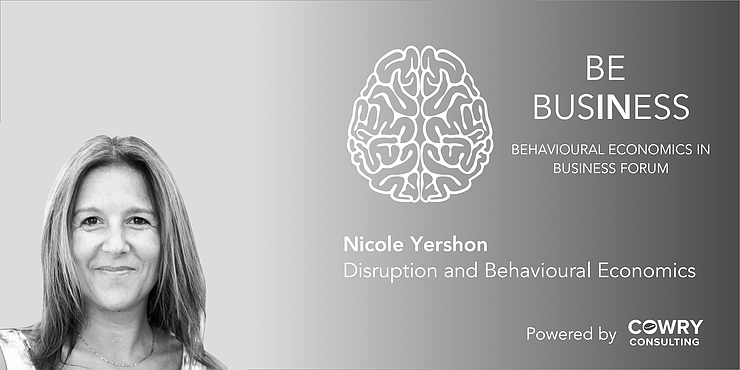 The keynote speaker will be Nicole Yershon who will share her experiences on how to use disruption and behavioural economics in business as a competitive advantage. Nicole is a consultant, speaker, judge, mentor connector and bestselling author. She works on the front line of innovation - bringing organisations into the 21st Century. She’s worked with a range of international clients including startup networks, entrepreneurs and businesses. Nicole is the founder of Lab For Hire™ and before that the Ogilvy Labs – a dedicated Innovation unit of Ogilvy & Mather Group. Part of WPP Group Plc. Nicole is also the author of bestselling book, Rough Diamond: Turning Disruption into Advantage in Business and Life. Juliet Hodges, Senior Behaviour Change Adviser at Bupa UK, will share insights from the cutting edge of behavioural science work from the Bupa Behaviour Change team. The Behaviour Change team is positioned as an internal agency within Bupa UK that helps the business understand and utilise current scientific thinking in Behavioural Science to further Bupa UK’s service delivery for their customers. The forum is an invite only event with limited space however if you are interested in attending please email theteam@cowryconsulting.com or register here. Location: The Studio, Headspace, 19-21 Hatton Garden, London EC1N 8BA. Friday, 23rd March 2018 from 10am-12pm.